The “alpine traverse” of UBC buildering. It’s got ups and downs. The ups are easy yet enjoyable, and the downs are committing. The 1968 Cragrat’s Guide details a shoulder stand to gain access to the final northern roof from the breezeway, however this is a bit of a pain — especially for the second person. Plus you now need to bring a rope to rappel. 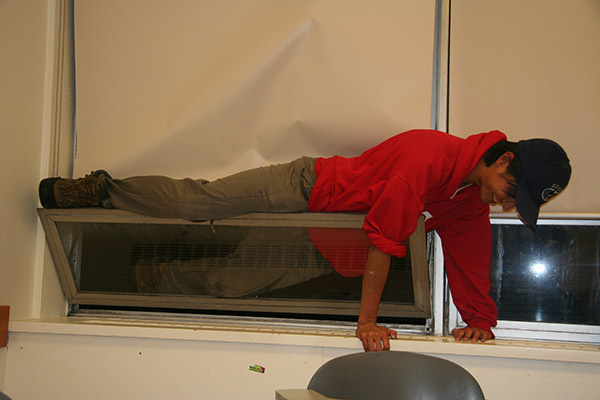 To avoid this, we’ve always climbed through a window from the roof of the breezeway, which is challenging in and of itself. However on one attempt a few months ago, a group of us had just dropped down onto the breezeway roof, when we noticed that they had replaced all the windows with new double paned ones that only crack open an inch or two. Ropeless and somewhat stuck, we proceeded to reverse the route via a shoulder stand. At this point a security guard spotted us from his nearby security trailer, and radioed for backup. 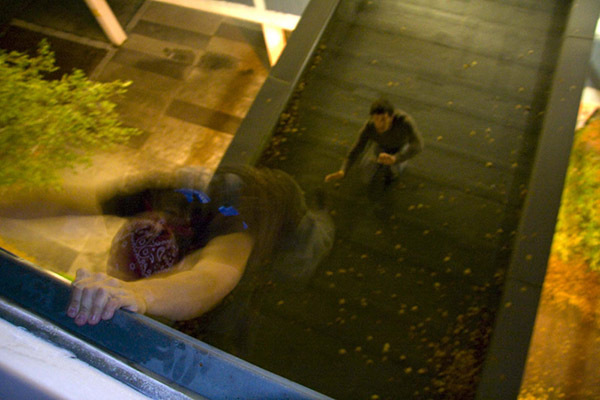 Cody, the last man on the roof, was unable to reach up and grab my hand. Instead he jumped from the roof of the breezeway to the roof of the security trailer — a 10′ gap with a 12′ drop. He didn’t stick around to see what the security guard had to say. Now that the trailer is gone, one had better be prepared to climb the entire route before committing to any drops. 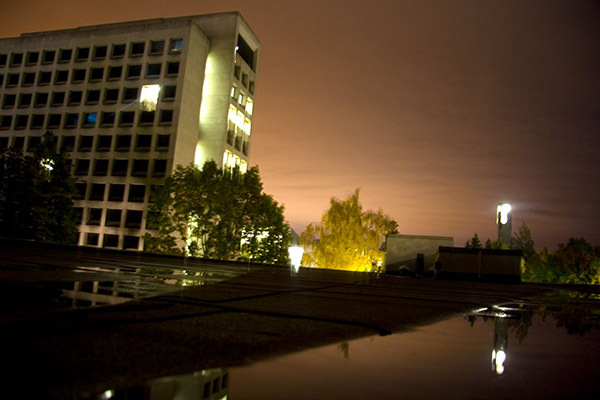 Rooftop view of Buch Tower and the Clock Tower. (p) Oker. Boris on the drop of no return. (p) Oker. Oker – Pre double-paned windows. (p) Ard. Now comes the problem of climbing to next roof, generally accomplished by combined shoulder stands and mantleshelf, or shoulder and claw hammer. This ends the difficulties. Rappel from snorkel pipe on inside corner of eastern section of building. This provides mild shock for anyone using adjacent stairs at time.